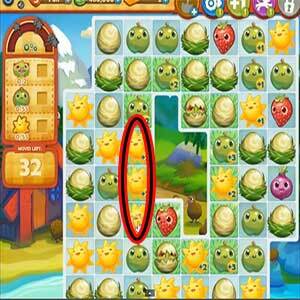 These Farm Heroes level 178 cheats and tips will help you beat level 178 of Farm Heroes. 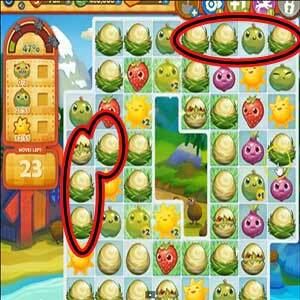 The objective of Farm Heroes level 178 is to collect 2 dragons, 55 apples, and 55 suns in 34moves. 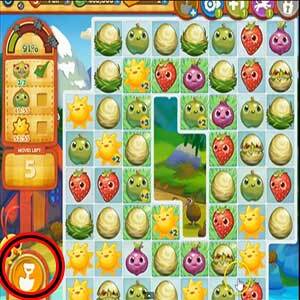 At the beginning of Farm Heroes Saga Level 178 you should focus on gathering all of the sun and green apple crops first. Most of the board is covered in grass meaning all of the crops will be happy ensuring you receive a good amount of points with every combination. The position of dragons on the board makes collecting them very difficult, they are spread out in various spaces and no two are near each other. Use the magic shovel booster to remove any unwanted crops around the dragons, watch out for compatible matches. Magic shovel’s have multiple purposes all of which are very useful for Farm Heroes Saga Level 178. Aside from using the the shovel to remove unwanted crops, you can also use the shovel to crack eggs open.